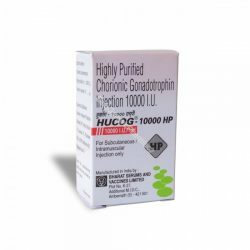 Human Chorionic Gonadotropin (HCG) - a natural human hormone contained in the female placenta during pregnancy. 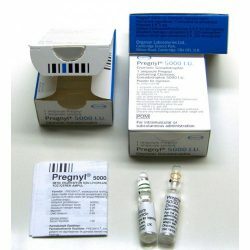 To obtain hCG in the form of a drug it is used urine of pregnant women, which is purified in the laboratory. Gonadotropin in its effect is similar to luteinizing hormone, which is a precursor of testosterone. Use of the drug orally is ineffective, as evidenced by numerous studies. Experiments conducted in the United States proved a complete failure of dietary supplements containing Human Chorionic Gonadotropin. In addition, in the US there is a ban on the use of this substance. By its action on the organism, Human Chorionic Gonadotropin is completely similar to the luteinizing hormone. As well as, luteinizing hormone, gonadotropin gives a signal through pituitary to the testes about strengthening of testosterone. In addition to its ability to increase the production of testosterone, the drug improves the quality of sperm, can do more pronounced secondary sexual characters, both men and women. In women, Chorionic Gonadotropin action is to strengthen the production of progesterone and accelerates the maturation of the egg. It also contributes to the formation of the placenta. Under natural conditions, the amount of Human Chorionic Gonadotropin is regulated by a feedback circuit in cooperation with hypothalamus, pituitary gland and testicles. Lack of hCG in the body leads to a reduction in testis size and reduction of their functionality. Artificial introduction of synthetic testosterone and its analogs gives the system hypothalamus-pituitary-testes to understand that the development of GnRH and Gonadotropin is required. Consequently, testicles lose their functions over time and decrease in size. Competitors who are taking Testosterone and its analogues must use Human Gonadotropin for the prevention of testicular atrophy. It is its function and is the main thing of this drug. Not too experienced bodybuilders use Chorionic Gonadotropin for gaining muscle mass in combination with other drugs. 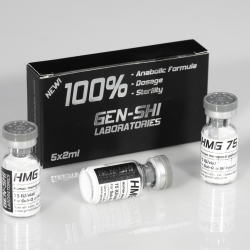 Its property to increase the production of testosterone is the reason for the introduction of hCG in the cycle. Also, it is used for "drying" to preserve muscle mass in conditions of reduced caloric intake. It is proved that the use of Human Chorionic Gonadotropin in bodybuilding for anabolic purposes is not justified. In addition, its use can cause health problems. The level of testosterone stimulation with this drug is significantly lower than when using synthetic forms of testosterone, and side effects are significantly higher. Why then use Human Chorionic Gonadotropin? The main advantage, which can give the use of Gonadotropin on cycle of anabolic steroids - is its ability to prevent testicular atrophy. When Gonadotropin is used significantly lower dose to prevent the decrease in testicular size than the dose required for the manifestation of its anabolic effect. Accordingly, the health risks are minimized when the maximum benefit is taken from the drug. Also Chorionic Gonadotropin has the property to soften and eliminate some of the side effects of anabolic agents. Use of the drug is allowed for "drying" to preserve muscle mass. In the event of a prolonged cycle of steroids, HCG becomes simply indispensable to prevent the loss of functionality of the axis hypothalamus-pituitary-testes. HCG use is not recommended during Post Cycle Therapy. You can buy HCG online without a prescription as an injection for subcutaneous or intramuscular administration. The drug should be diluted in a special liquid ampoules, which is attached to the drug. 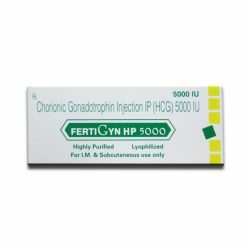 Chorionic Gonadotropin need to be injected intramuscularly where the drug quickly dissolves. Duration of its action is 5-6 days. If the cycle duration of anabolic steroids is at least 5-6 weeks the use of HCG is not necessary. 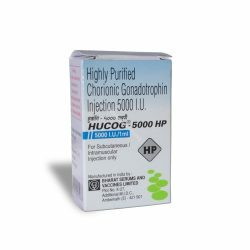 In the case of a longer cycle of anabolic steroids or use of steroids in high dosages, then Human Chorionic Gonadotropin need to be taken two times a week in an amount of 250-500 IU. If, during a heavy cycle HCG is not used, it is recommended to include it in the post-cycle therapy. During post cycle therapy it is recommended to take a dosage of 2000 IU. Do injections every other day for 3 weeks. Professionals athletes, who are almost continuously use anabolic steroids, it is recommended to include it in the cycle on a regular basis. After 5 weeks of intake, you will need to take a break for 1-2 weeks. Deregulation of the axis hypothalamus-pituitary-testes. Baldness and increased body hairiness. Bodybuilding forums dominated are by positive feedbacks on Gonadotropin, using it on PCT and during voluminous and long-term cycles of anabolic steroids. The use of HCG is justified only for men. Chorionic Gonadotropin does not apply to women's cycles, and is not meant to "treat" the effects of flavoring. Negative reviews about Human Chorionic Gonadotropin (hCG) can be found in small quantities, as it is rarely used in anabolic purposes. Typically, these are written by people who try to build up to 10 kg of muscle in a cycle with chemical pharmacology, and thus also to lose weight.